Avalanche dumps the critical path and embraces the Apex engine's absurdities. Avalanche founder Christofer Sundberg says the Just Cause series started with the idea that a player should be able to skydive out of a plane and land on a moving car. Over four entries in the series, that ethos has remained consistent, even as developers added bigger explosions, a wingsuit, and the unbridled destructive power of tornadoes. Speaking to GameDaily at New York Comic Con, Sundberg, Narrative director Omar Shakir, and senior producer Chris Supino pulled apart the Just Cause formula to decode the franchise’s DNA. As it turns out, a huge piece of what sets Just Cause apart from other open world games is its love affair with bugs. When development started, Sundberg had the idea that he wanted to get a player from high in the air safely to the ground. But the means to make that work weren’t entirely clear. 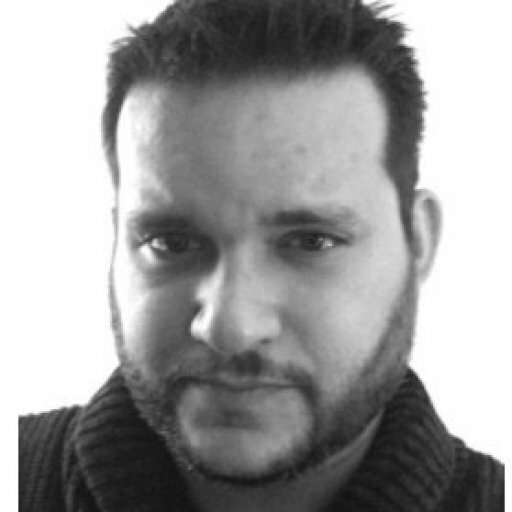 It was a the QA process that gave Avalanche the idea for two of Just Cause’s defining elements: the grappling hook and hero Rico Rodriguez’s parachute. Just Cause’s grapple gun (later a wrist-mounted grappling hook that doesn’t need to be equipped) began as a debug tool. A member of the team was tired of running around to get to different bug locations and programmed the ability to zip Rico to any point the player could see. It worked so well that it was implemented as one of the franchise’s defining features. Even if something doesn’t actively break the game or hinder the player, it might not make the cut. There’s a level of trust built between player and developer that demands that systems behave with a measure of predictability. Repeatability isn’t the only factor. Sundberg is adamant about ensuring that the game doesn’t break, and there are more ways than player hindrance to disrupt an experience. Just Cause 4 is build on the idea of player choice and variety. Preserving that freedom is crucial to Avalanche’s philosophy. How much freedom is too much? Bugs aren’t the only challenge for Avalanche as they add more systems to Just Cause 4. The extreme weather (tornadoes, electrical storms, and more) adds another layer. Players can visit one of the four different biomes and experience a different natural hazard that can wreak delightful havoc. Flying into a tornado is perilous, but whipping out of it is exhilarating. Trust plays a role here, also. Avalanche has to put its faith in the technical design and artistic direction as it welcomes players into Just Cause 4’s sandbox. Sundberg says that Avalanche has worked to find a balance. Just Cause kept players too rigidly on a narrative path. 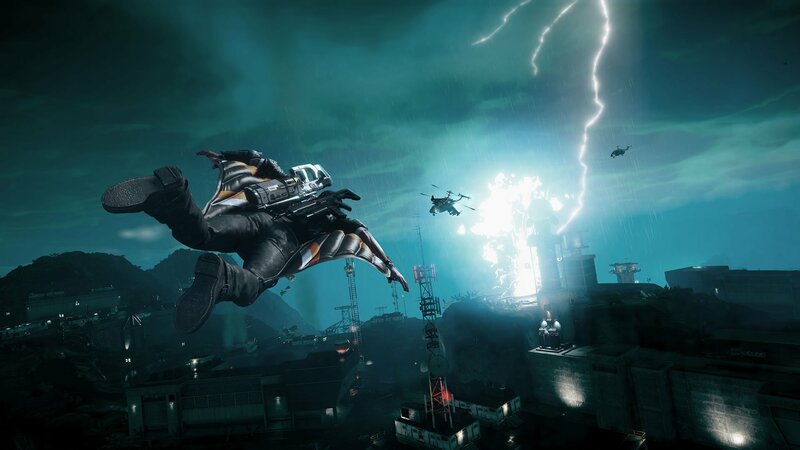 Just Cause 2 left players with a bit to much freedom, as nearly all limitations were removed. In Just Cause 4, the team is focused on putting player choice and gameplay cohesion on a scale. Just Cause 4’s South American island, Solís, is large (as big as Just Cause 3’s 400 square mile Mediterranean Midici). Traversing the map is part of the fun, but Avalanche doesn’t want to constrain players based on story beats. There’s not much joy in working your way all the way across the island only to find out you need to double back to the start to progress the narrative. Avalanche has thrown out the idea of a critical path (a specific beeline through a game’s story from start to finish). Instead, the narrative is closer to a web. That’s not to say that completing key story beats isn’t incentivized. Players will still unlock different items by progressing. Avalanche accomplishes this by intertwining Just Cause 4’s dual narrative approach. Because of this, Avalanche refuses to answer one of gaming’s most common questions. Putting a fine point on how long the story takes to complete becomes challenging when you throw players into the sandbox. This approach results in a development process that considers players as much as it looks inward. Player experience is always important in game design and development, but Avalanche takes some of its inspiration from end users. 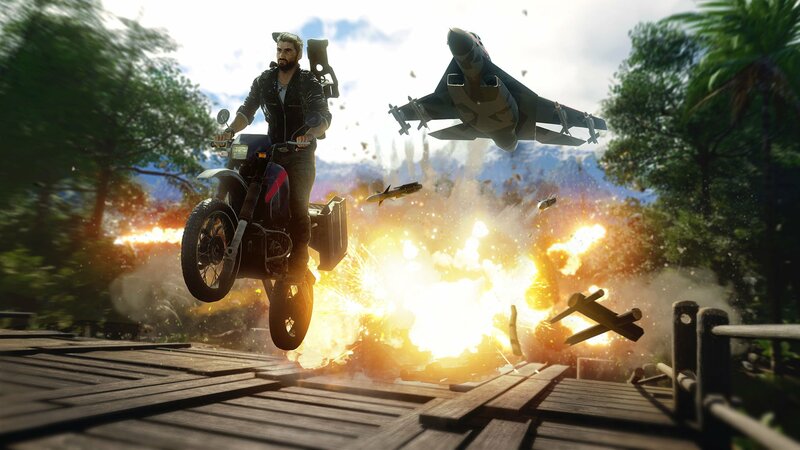 Avalanche embraces the idea of tinkering with Just Cause’s systems. At regular intervals throughout development, regular work is put on hold so the team can focus on uncovering and refining fun and unexpected things that are possible when Just Cause’s systems collide. Sundberg and his team seem delighted when players color outside the lines. 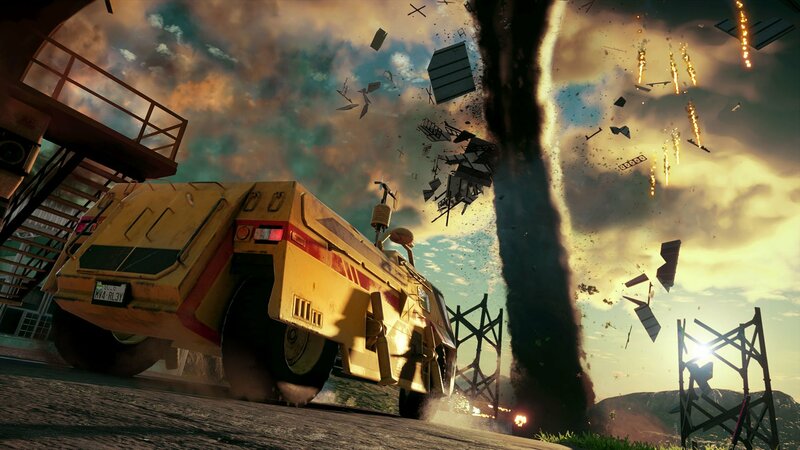 Just Cause 4 inspires players to chase storms, create explosions, and find creative ways to tinker with the multitude of cars, trucks, planes, and boats. Strange things are going to happen, and that’s part of the fun.